Fights tough stains with extracts of soy and micro-scrubbers while essential oils of mint deodorize toilet bowl odors. No harsh fumes, acids or caustics. 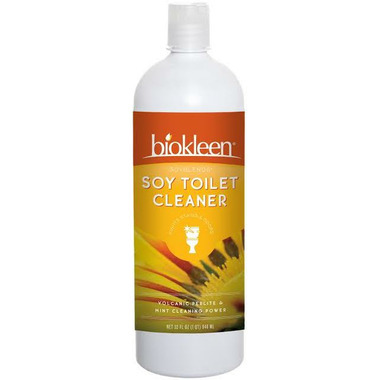 Discover the cleaning power of soy! Powerful soy and micro-scrubbers for tough toilet stains. Essential oils of mint deodorize toilet odors. For toilet and odors apply directly to toilet bowl and under rim. Scrub lightly, allowing the micro-scrubbers to do the work. No need to let sit. Ingredients: Water (filtered), Methyl Soyate, Laureth 7 (plant based surfactant), Caprylyl/Capryl Glucoside (plant based surfactant), C10-16 Alkyl Glucoside, Perlite, Sodium Silicate, Xamthan Gum (plant based stabilizer) Zeolite, Citrus Grandis (Grapefruit) Seed Extract, Glycerin.